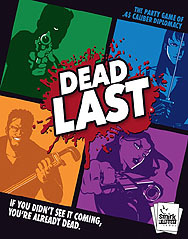 DEAD LAST is a 'social collusion' game for profit, where 6-12 players conspire and vote upon whom to kill each round, all in an effort to be the last player standing and collect gold. You must be 'in the know' and vote with the largest group to stay live. The fun part - absolutely ANY means of communication is allowed as you plot... a glance, a nod, pointing a finger, flashing their card, anything - but make sure you don't tip off the target or they could ambush you instead! There is no 'hidden traitor'. You are all equally allies and betrayers at any given time. Choose your moment well. Trust no one. And know that the instant you ask, 'Who wants to play Dead Last?' the game's already begun.